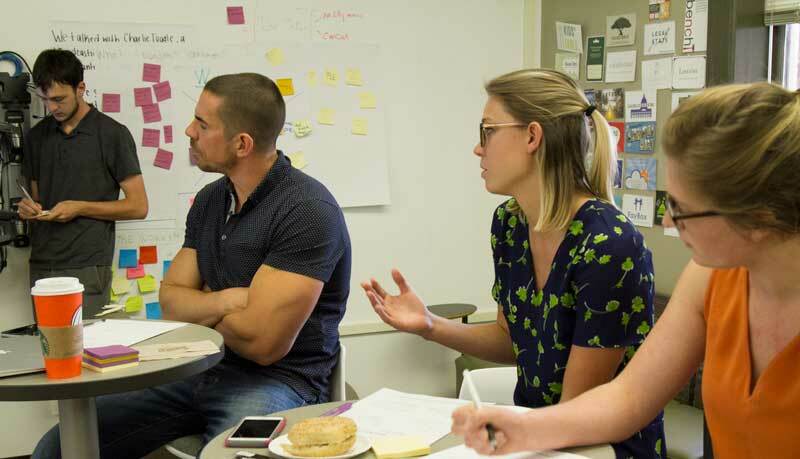 Guest judge Chelsea Brown (center) critiques a product pitch in class on September 28, 2017. To an outsider, “MEJO 463: Creating Tomorrow’s Products” might appear to be more at home in the UNC Kenan-Flagler Business School. But to anyone involved in the news and media industry, the course is exactly what juniors and seniors in the UNC School of Media and Journalism ought to study. The class is taught in the Reese News Lab, which has buzzed with innovation since its founding in 2010 from a $4.1 million gift from the estate of alumnus Reese Felts. 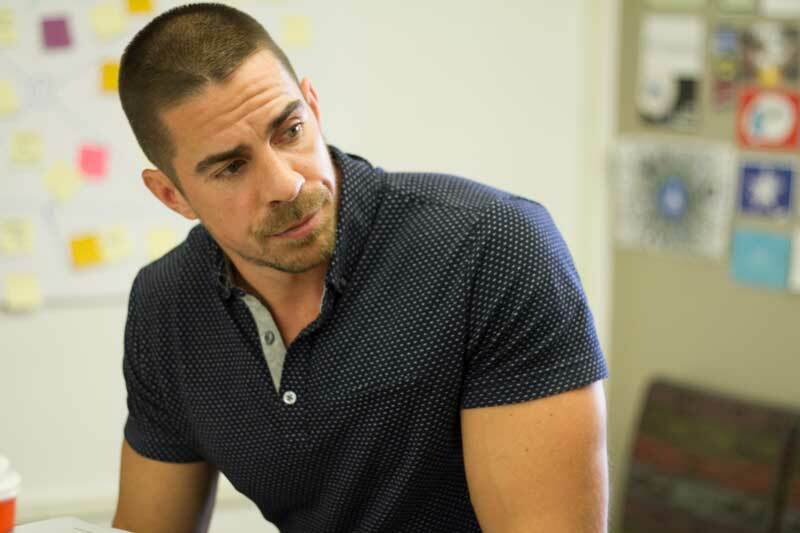 Jeremy Gockel, adjunct professor and director of team development and entrepreneurship at the McClatchy Company, teaches the twice-weekly class. The course is modeled on a startup accelerator typical of Silicon Valley institutions — an intensive, cohort-based, mentorship-driven model culminating in a pitch or demo day. Students break into small teams and consider three factors to evaluate their unique product idea: desirability, feasibility and viability. Gockel emphasizes the importance of design-thinking processes in the course. At the start of the semester, he wants students to focus on product desirability by clearly defining a problem that people want to tackle. He says students should always ask themselves: why? “That is the easiest tool in your pocket – asking what drives peoples’ decisions and not accepting generalizations,” says Gockel. Students consider the consumer experience by asking questions like: Is this product currently represented in the market? Is there a desire for it? Then, they look at the other tiers — feasibility and viability — to determine if it is a sustainable business model. 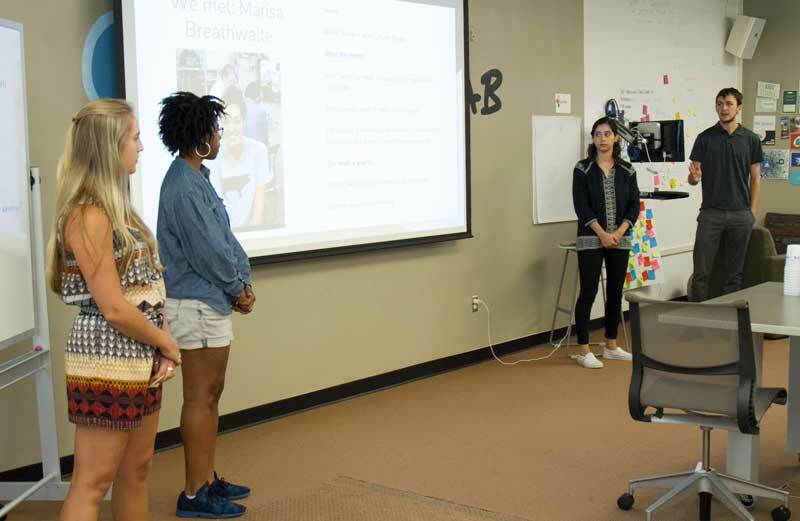 A team pitches their product on September 28, 2017 in the Reese News Lab. From left: Colleen Brown, Courtney Staton, Rashaan Ayesh and Jackson Cowart. Guest judges, most of whom work in business development and innovation, help Gockel give feedback to students on pitch days. Often, the guest judges have first-hand experience with the pitch process, having gone through the class themselves. “I’ve spent a lot of hours in this room,” laughs Abby Reimer ’15, innovation manager at McClatchy and frequent guest judge. “Business sense and understanding money and profitability are something most journalists and media companies are lacking. Reese News Lab prepares people to understand that, and I think it’s crucially important now,” says Reimer. Jeremey Gockel teaches the course in addition to leading the innovation team at McClatchy Company in Raleigh, North Carolina. 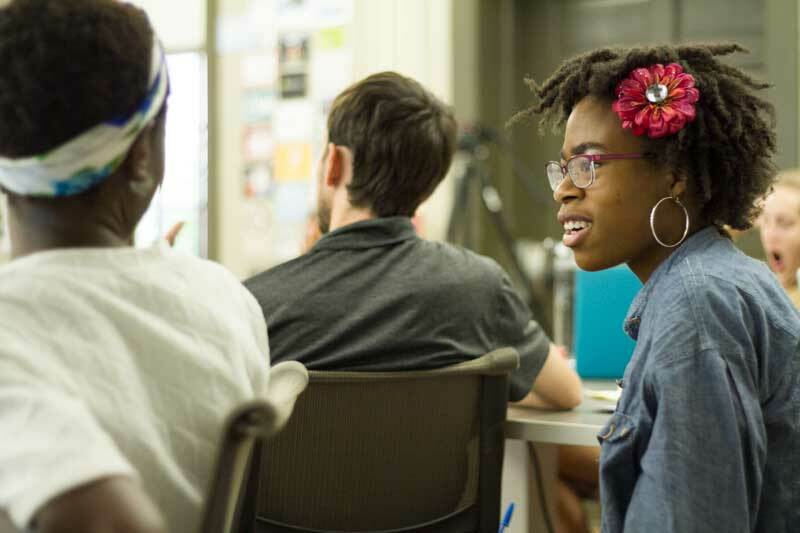 From a student perspective, the class gives them a new perspective on life after college. Lilli Mercho, an MJ-school senior studying multimedia, enjoys the challenge of thinking outside of the box. “I was thinking journalism is traditional reporting, but this is a more nontraditional field. It’s definitely opened my eyes. There are a lot more possibilities other than just being a reporter,” says Mercho. The winner for the Fall 2017 preliminary pitch day was “Soundbite,” a location-based app that sends push notifications containing podcasts tagged with the phone’s current location. Throughout the semester, “Soundbite” and other product ideas will be further scrutinized and retooled before being evaluated by judges in a final pitch day. Courtney Staton discusses a pitch with a fellow student. Have any ideas made their way out of the classroom? A few semesters ago, students developed a prototype of an artificially intelligent chatbot called Mr. Reese, which has been adopted by Media Innovation Fellows working with local news organizations and technology leaders and has the potential to be a tool for many different newsrooms. A full list of projects can be found here. Developing an idea into a prototype is not the impetus for the course. Students are encouraged to take full advantage of the resources in the lab to experiment and become comfortable with the process of innovation. When they enter the industry as professionals, they have all the tools and empathy needed to adjust to the constant pace of change in journalism and media.